Grilled Citrus Chicken Kabobs are one of the easiest grilled chicken shish kebob recipes I make and they are always a big hit with family and friends. The citrus chicken marinade is a wonderful blend of oranges, lemons, and limes really add amazing flavor! The citrus marinade for chicken and the veggies are a perfect blend of tart and savory flavors to make the chicken shish kabobs a crowd pleaser! 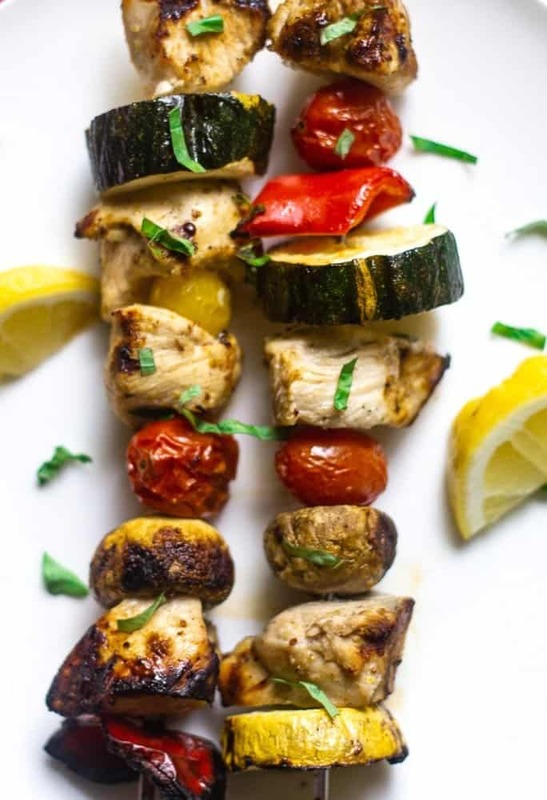 Grilled citrus chicken kabobs have a great balance of protein and from the chicken added nutrition from the tasty addition of the zucchini, tomato, and peppers from the garden! We love mushroom and onions so I added them to the kabobs. The citrus chicken marinade adds such a great flavor that keeps the chicken and veggies juicy and full of flavor. Even better, these grilled chicken kabobs are a great make ahead dish and are great eaten at room temperature. Another perk of these grilled chicken kababs is the ability to adding in veggies for those who don’t embrace the idea of the beloved vegetable! Kids love kabobs and forget they are eating veggies! 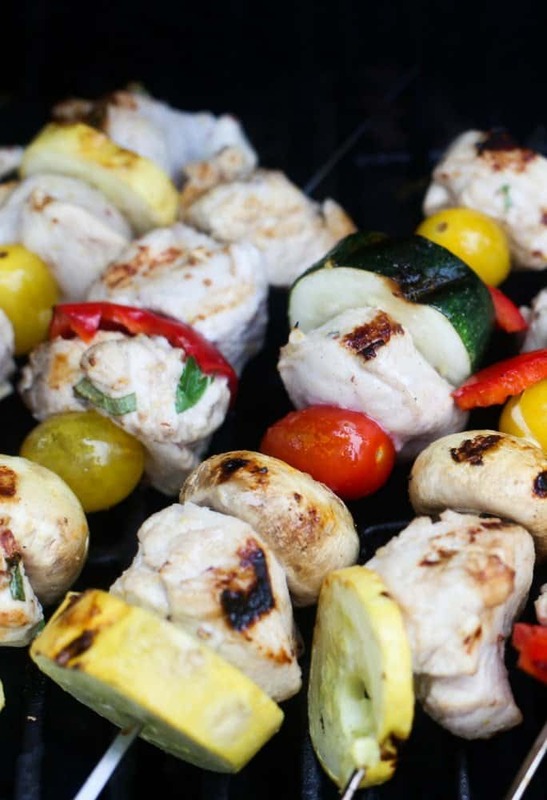 We love Chicken Shish Kebobs, what are the origins of shish kebobs? Shish kebobs originated in Turkey and shish kebob in English means roast meat, so interesting when we start thinking where everything originates. How long does it take to grill chicken kebobs and at what temperature? Pre-heat the grill to about 500 degrees and then keep the temperature at 450 while grilling the chicken kabobs. It takes about 15 minutes to grill the chicken shish kababs turning frequently. When making chicken kabobs, how do I prevent the skewers from burning? I highly recommend purchasing metal skewers. You can order through Amazon or pick up some at any local Lowe’s or Home Depot. The metal skewers are longer and you will re-use often. That said, to prevent the wood from burning, wooden skewers need to be soaked in water before using to make kabobs, at least 30 minutes or up to 3 hours. 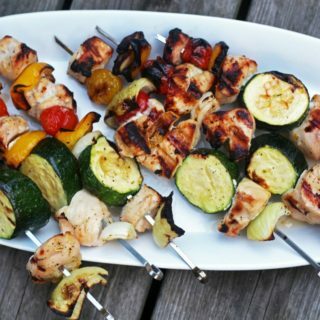 What sides do you serve with Grilled Citrus Chicken Kabobs? These chicken kabobs are marinated in a combination of oranges, limes, lemons and of course garlic and herbs. I like to marinate the chicken and veggies for a few hours and overnight is even better! The citrus blend gives a wonderful flavor to the chicken and veggies. These grilled chicken citrus kabobs are fabulous on their own or over salad greens, over Roasted Spaghetti Squash, rice, or riced cauliflower. If using wooden skewers, soak in water. 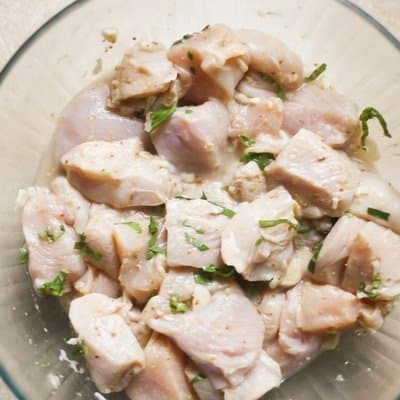 Make the citrus marinade by combining the orange juice, lime juice, lemon juice, red wine vinegar, olive oil, Dijon mustard, minced garlic, onion powder, basil, parsley, and season with salt and pepper. In a bowl or plastic bag add 1/2 the marinade and add the chicken cubes. Marinate 1 – 3 hours. In a second bowl or plastic bag add the cut up veggies and 4 Tablespoons of the remaining marinade. Let them marinate the same amount of time as the chicken. Set the remaining marinade aside to use to baste the chicken kabobs while they are served. Remove the chicken and veggies from the marinade and discard the marinades. Skewer the chicken and veggies onto the skewers. I always start with a veggie that is hearty either an onion or pepper. Grill the Citrus Maarinated Chicken Kabobs until cooked through about 15 minutes. Serve and enjoy! When you make Grilled Citrus Chicken Kabobs, take a pic and tag me on Instagram @everyday_eileen or #everydayeileen. We love seeing your recipes and I try to repost the pics. 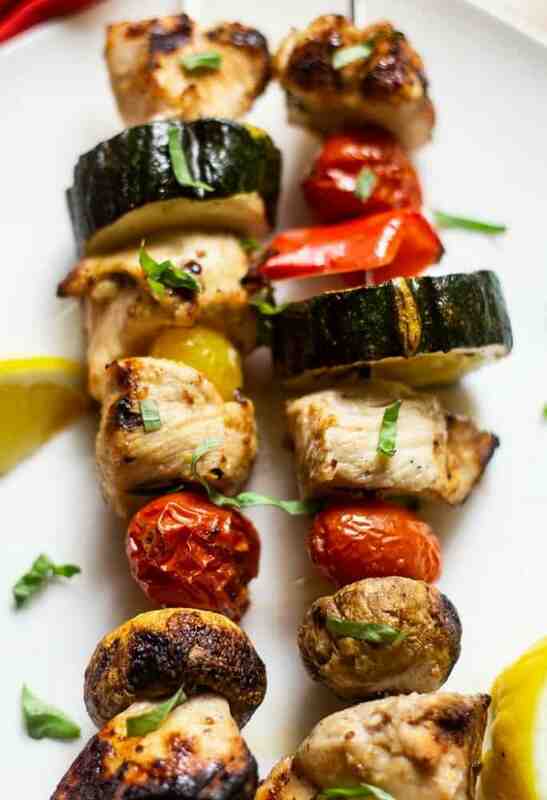 Are you loving these Grilled Citrus Chicken Kabobs, giving it a 5-star rating and any comments are super helpful for me and very much appreciated! Citrus marinade for boneless chicken breasts adds amazing fruity flavor to chicken and veggies. Great flavors to make easy kabobs for summer BBQ. In a medium bowl, combine the juices, red wine vinegar, olive oil, Dijon mustard, minced garlic, onion powder, basil, parsley, salt and pepper to taste. In a large storage bag, add the cubed chicken, zucchini, cherry tomatoes, mushrooms, onions, and yellow peppers and add in the marinade. Seal the bag and refrigerate for at least an hour up to overnight. Spray grill with non-stick spray and preheat grill to medium heat. Remove the chicken and veggies from marinade and discard remaining marinade. Thread the chicken and veggies onto skewers. Cook chicken and veggie skewers, turning regularly until cooked through. Turn them regularly so the skewers do not burn. About 15 minutes to cook through. Serve with salad, rice, cole slaw etc. Adjust veggies to any your family and friends enjoy. We love these kabobs. The marinade also works for our pork too!